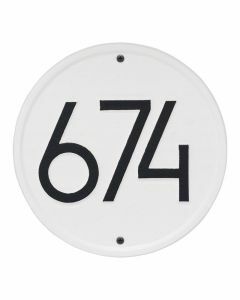 Ramp up your curb appeal with the Delaware Modern address plaque. 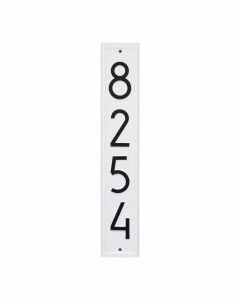 The combination of a contemporary font and subtle border give this plaque its modern look. 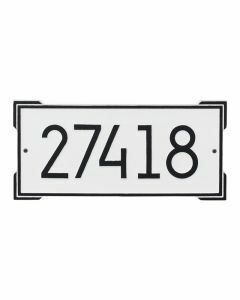 Whitehall address plaques are proudly handcrafted in the USA using American materials and labor. 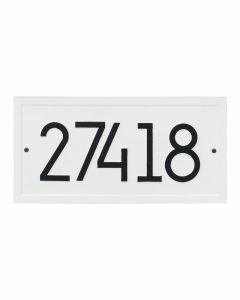 Whitehall address plaques are suitable for all exterior applications. It measures 11” x 11” x 0.325” and weighs 2.75lbs. Made of aluminum. Line 1: 3 - 4" Numbers. Horizontal orientation. Available in the following colors: Aged Bronze, Black/Silver, Coastal Clay, Coastal Green, Oil Rubbed Bronze, Pewter/Silver and White/Black. Please choose color and enter your personalization exactly as you would like for it to appear below. Includes assembly instructions. Ships via FedEx. Click on image for greater detail.